The following study was done by a group of Students at the Siebel Institute in 2007.It is the most comprehensive study we have found to date on information comparing Tunnel and Flash Pasteurization on the internet. Is the line cold filling? If so, to bring the product temperature up after filling for packaging requires a warmer is in the operation. This is a significant point in both capital and operating cost. The warmer represents the "non regenerative" (most expensive) portion of the tunnel pasteurizer. The need for a warmer significantly tips the scale on if there will be "savings" on Capital, Operating Costs (including utilities) and Floorspace in the comparison of the two technologies. QC Analysis must be part of the plan. In the Flash scenario we need to ensure and confirm that the filling equipment, containers, and closures will reach and maintain the same state as the pasteurized product arriving to the filler. If the filling operation is not Aseptic there must be a "sanitation" program at the filler in the flash and sterile filtration program. This could have different impacts depending on the product and operation, but needs to be in the numbers. In the scenario above a new "aseptic" filler was budgeted. The budget for the flash pasteurizer included a machine which had "Advanced Alarming and Controls", as well as a sterile buffer tank. Where the tunnel pasteurization process is conclusive and confirmable by use of a travelling recorder. The flash and sterile filtration scenarios require QC testing run on an ongoing basis. The conclusion of QC analysis at the time the product is filled states the condition of the environment where the product was filled. Product would also have to be tested and (in many cases) tested over time to conclude if the sterile filtration and flash processes were conclusive. The flash unit, while not as conclusive and confirmable as the tunnel pasteurization process, relies on sensors to verify the temperature of the product, and the time the product is at temperature would be verified by a time calculation based on the pump speed. The process can be confirmed by sensors and calculation, but the actual experience (in terms of time and temperature) cannot be confirmed at the same level as the tunnel pasteurizer. The cost of installation for a tunnel warmer and a tunnel pasteurizer would not be far off in this case. Assuming the same utility connections, both are single deck and the "scenario" was considering this as a replacement project. In this light the cost of installing either is approximately the same, therefore, the flash unit, sterile buffer tank, and filler all create additional installation costs. If an existing tunnel pasteurizer were to be replaced, it would also require conveyor and controls to close the gap in the line in order that a smaller footprint warmer would fit. A cooling tower was not considered for the warmer scenario, as treated in the assumptions that it already existed for the tunnel pasteurizer. Bear in mind if this were not a machine replacement scenario, this could bring an extra expense into a "flash + warmer" and tunnel pasteurizer scenarios equally. In any study of pasteurization, there must be some confirmation that the process is working to kill undesirable organisms from the product. In the Tunnel Scenario, it was considered to be the machines controls alarming in conjunction with a "traveler" (passes through the machine and records the temperature profile in the bottle) which is downloadable to a PC in the quality lab. In the flash scenario it was assumed that the flash must have the same level of "sensing redundancy" and "PLC Control" as the tunnel pasteurizer. This indicates that several of the "entry level" / lower cost flash units would not be fail safe for the application. It was also assumed in the flash scenario that the packaging operation must have the ability to "SWAB" and confirm the level of sanitation at the filler and capper. It would also require a "hold" period following which samples could be taken of the finished product and confirmed the process was effective.As stated in a previous article, both processes are effective. Properly applied, the flash will pasteurize the product to perfection. Following that the plant needs to ensure that the systems are in place that the product, containers, and closures are kept in the same state. The tunnel unit will pasteurize the product and container in the finished state, and is a readily "confirmable" process. It indicates that less QC "maintenance" will be required. Steam energy consumption was considered in total MMBTU per year. The tunnel pasteurizer was the highest, and the steam consumption from the flash unit was quoted by the manufacturer as dramatically lower. The scenarios where a warmer was required added much of the steam savings back into the plants consumption in the other two scenarios. If a warmer is needed the energy savings of the flash pasteurizer is not fully realized. The supriting data in this study is the comparison with filtration. 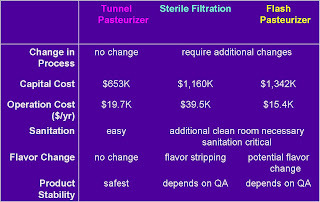 The team found that the cost of filters quoted to them was higher than anticipated, indicating that sterile filtration would be the highest of all the options. The view on affluent is that it was (in this case) "free". The students at the brewing academy calculated that the flushing of the specified filters would be ongoing as filters were alternated to support continuous production. Based on their calculation the filtration scenario would send significant water to drain. What’s more the water would be heavy in yeast content and require treatment. The warmer was considered to have some incremental water usage. In the event of a stoppage, the flash unit would chase product out of the circuit with water, and would create both beer waste and water waste each time the filler has a meaningful stop. While the tunnel pasteurizer wastewater can be recycled and re-used through the cooling tower loop, water used for the sterile filtration and flash pasteurizer (as it is discharged with beer) would produce more water which is requires treatment. The reality is that a cooling tower (to cool and re-use water and avoid effluent) was left out of all three studies but would only serve useful purpose in the tunnel scenarios. In this analysis the cooling tower is existing. In installations where this is not the case (new installations vs. machine replacements) the cost of the cooling tower would need to be considered. 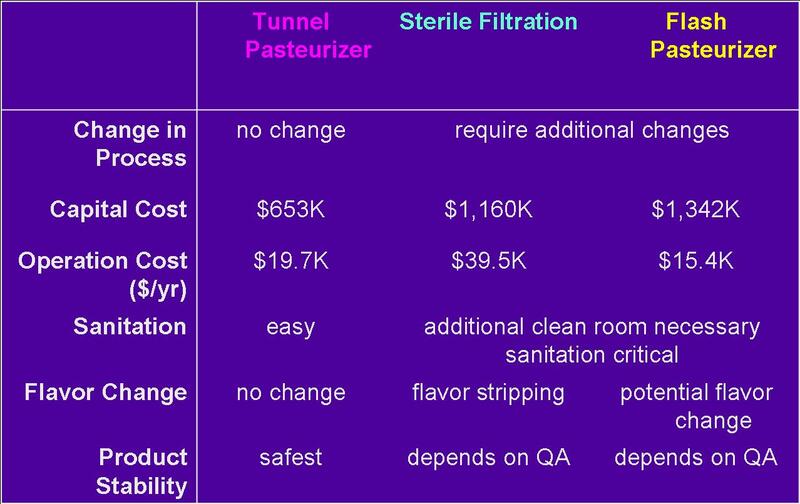 In brief, the team concluded that, while not pleased with the amount of water consumption of the tunnel pasteurizer, the tunnel pasteurizer water was a “better water” to have to deal with as opposed to the discharge of the sterile filtration system or the flash. There were concerns about the technical difficulties with the Malta Beer production in Sterile Filtration and Flash Pasteurization. Malta is thick in consistency and there would be slow filtration throughput due to high viscosity (sugar concentration) and multiple stages of filtration would be needed. The whole product (beer, crown, bottle) are pasteurized which the team considered to be the ideal scenario from a bacteriological standpoint. The tunnel pasteurizer would serve as a “catch all” for any stray yeast strains, or other flavor changing organisms which may be resident in the package or product. The process in the evaluation that sanitation should slip would mean downtime to the line, and product that is put on QC hold while it is examined and (depending on the situation) placed on QC hold. This could be disruptive to the overall operations of the brewery. Sterile Filtration may strip flavors and large proteins below the 2µ level. This would be lesser of an issue for the Light Lager production, but would affect thicker products. Sensory tests need to be conducted, but it is anticipated that there may be less flavor impact at time of departure from the brewery using flash and sterile filtration as the product has been exposed to less heat treatment than in tunnel. Considering that the distribution of the product is often non refreigerated after the product leaves the brewery, this was considered to be less of an issue. The team concluded that while there may be some slight savings depending on the final pieces of equipment specified, the initial dramatic savings on floorspace that they had anticipated was not going to be realized. It was also noted that scenarios (2) and (3) have utilize a balance of space between the process area and the packaging area, the tunnel confines all the space to the packaging area. The team concluded to purchase a replacement tunnel pasteurizer for the brewery. The confirmation that the tunnel pasteurizer is performing the right process is readily confirmable. By using a travelling recorder it is possible to see the exact process which is happening to the beer. Impact on flavor in distribution is considered dramatically higher than the impact on flavor in packaging. As such the major consideration on flavor was to product product which was “consistent”, which was also thought to give strength to the tunnel pasteurizer. Energy savings in terms of steam with the flash unit was offset by the warmer. The tunnel and flash pasteurizers are both energy regenerative in nature – heat put into the product on the initial part of the process is replaced at the end of the process. The Flash unit itself would perform better than the tunnel, but the addition of the warmer again offsets the savings.